Oddly enough, Mary doesn't remember anything before she woke up at the house of Nick and Nora Bromfield and was adopted by them. The pair never pried and Mary, no matter how hard she tried, could not remember. The best she could do was go on with her life as the Bromfield's daughter. She wanted for nothing and had a decent life. She went to high school and had good grades and was the quintessential perfect daughter. 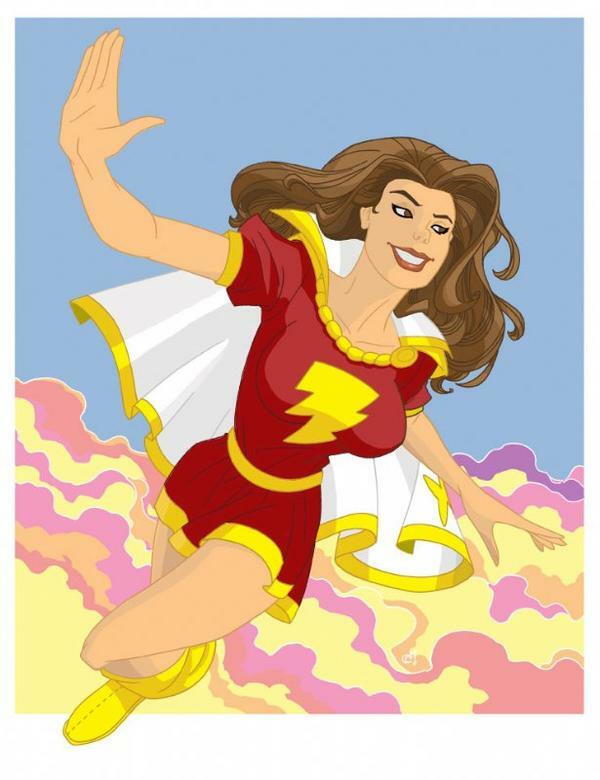 However, her past was wrought with pain, and the wizard known as Shazam had known of this pain. He had Mary summoned, brought to him by a man in dark clothes. Mary tied to resist, an immediate fear of kidnapping, but had no choice. The wizard had informed her that she had suffered great pain yet does not remember any of it. He would not remind her, but promised that all would be revealed at the right time. The wizard Shazam had also told Mary that she would yet see more pain, but he would give her the power not only to endure it, but to beat it back and be the hero that he needed. He knew that he did not have much time left in this world and wanted Mary to take up his mantel of fighting evil. He chose her to be his Champion. He promised that whenever she called upon his name, she would have bestowed upon her the wisdom of Solomon, the strength of Hercules, the stamina of Ares, the power of Zeus, the courage of Achilles, and the speed of Mercury. She agreed to take on the role, without even truly knowing what this entailed. When Mary called upon Shazam for the first time, she had taken on the form of a mature woman, not the mere teenager that she truly was. Mary was brought up with a strong sense of right and wrong, and always had the urge to work for the side of the right. She has the need to help others, especially those that cannot help themselves. Mary doesn't remember what happened during the first nine years of her life, and there will always be the constant yearning to know, even though she'd been warned that it was filled with pain. Mary always looks on the Bright Side of Life. no matter how grim the situation is, she refuse to be down about it and uses that optimism to help come up with a resolution to every problem. She's constantly cheerful, to the point of annoying others. 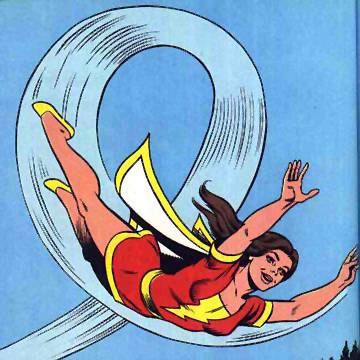 It's this purity of spirit that drew Shazam to choose her in the first place. Mary always had a keen knack for knowledge. She's a consummate learner, taking in information like a sponge. This, combined with her optimism, gives her a sense of wonder of the world around her. She looks at everything as if with a new set of eyes, or for the first time. Mary's motivated by the wizard Shazam, and her own sense of right to battle evil in all forms and to help all, no matter what the need nor the purity of their hearts. She still doesn't understand why Shazam had chosen her and only hopes to prove herself truly worthy. Mary's goals are to bring evildoers to justice and to protect those that cannot protect themselves. She might like to join up with others on the same quest. However way she does it, she wants to do it to the best of her abilities. Miss Marvel has exceptional photographic recall and mental acuity allowing her to read and decipher hieroglyphics, recall everything she has ever learned and solve long mathematical equations. Instantaneously she can make intuitive guesses based on limited data; to the point her guesses are almost always correct; also she has a great understanding of divine phenomenon in the mortal world. She also possesses an uncanny awareness of her circumstances that allows her to turn disadvantages into advantages. Through sheer power and magic she can hypnotize people for length of time. Only those of great willpower can overcome this ability. Finally, she can speak every language known to humans as well as ancient or dead languages and is able to understand aliens. Mary has the ability to lift and/or press volumes of mass far in excess to that normally possible for a human being functioning in Earth gravity. She has strength comparable to Wonder Woman and Superman, though fractionally less. Mary has been given the gift of limitless endurance. This superhuman ability lends to her ability to stay as Miss Marvel for elongated periods of time, survive in space and fight seemingly endless battles. She does not need to eat, sleep, or breathe as Miss Marvel and her incredible metabolism endows her with practically infinite endurance and inexhaustible stamina. Her muscles, height increase, weight, mass and all physical properties that differ from Mary Bromfield's are a magical enhancement. Miss Marvel is a creature of pure and ancient magic. This allows for her ability to resist magic spells. If she is injured in battle she may call on the magical lightning to heal herself and mend wounds. If wounded, her divine and supernatural energies enable her to recover at other worldly speed. Miss Marvel is virtually invulnerable, and resistant to all types of physical injuries. Her resilience to damage is on par with beings such as Superman, but without the weaknesses. With the Courage of Achilles combined with the Wisdom of Solomon and the personality of Mary Bromfield this creates a certain kind of optimism of which Miss Marvel is supremely known for. Able to smile down most opponents and using her powers in special ways other than fighting, Miss Marvel will forever remain the staple "girl scout". 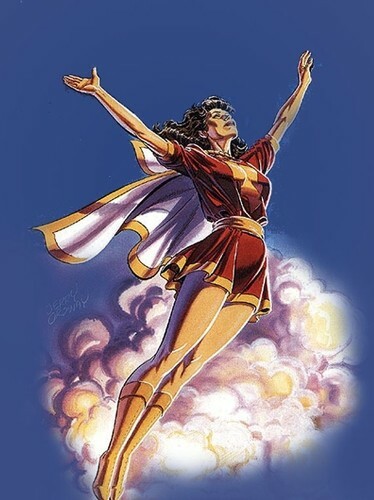 By channeling Mercury's speed, Miss Marvel can easily fly and move at speeds far exceeding Mach 10 (2 miles a second) while in earth's atmosphere. She can move at incredible speeds making her at least fast enough to race the Flash on foot. Miss Marvel can move fast enough to render herself invisible and seemingly vanish and disappear at will. She can also mystically fly through the atmosphere. This enables her to soar effortlessly to sub-orbital levels and travel across the planet in blinding speed. She can travel through space, but has sometimes uses devices to ease communication during interstellar travel. Mary lives with her adoptive parents, Nick & Nora Bromfield. They own a decent house in Queens, NY. They're well off and Mary wants for nothing. Except maybe a car. Mary obtained her powers from the wizard Shazam. She can still consult with him for advice, and being young and inexperienced, she often does. He resides at the Rock of Eternity and Mary can access it any times she needs to see him. Mary exists in two different forms, with one psyche. She's always Mary Bromfield, the 16 year old girl with the wide eyes and kind heart. When she calls upon the powers of Shazam, she's Miss Marvel, an older woman with the power and the knowledge of the Gods. She's always Mary on the inside, no matter what form she takes. Thanks to the Wisdom of Solomon, Miss Marvel has the ability to speak and understand languages. All of them, from the earliest deadest language up to the most alien. Mary does not have this ability. Due to her optimism and continuously harmonious demeanor, Mary makes friends easily and keeps them. She doesn't discriminate and does everything she can to help her friends. With her skills as Miss Marvel, Mary makes an excellent leader, guided by Solomon's wisdom. She can persuade nearly any group of people and uses the same skill to talk her way out of situations instead of having to resort to violence. Since the age of 10, Mary's been enrolled in Miss Cecile's Dance Academy. She's adept in ballet, jazz, and ballroom. She continues to practice and performs in recitals. She's competed at the local level. Along with dance, the Bromfields also made sure that Mary had access to a stable and lessons for horseback riding. She's been riding, literally, for as long as she can remember and has no issue with horses. Yes, teens have a skill. As a modern teen, Mary knows how to use modern technology, including a smartphone with camera and the knowledge of texting. She also knows which shops to avoid at the mall and which member of the football team has the cutest smile. Mary's powers can be cancelled out by any powerful magic user, like Dr. Fate or Dr. Strange. (or Dr. Strangefate). This mostly works by taking away the magic that transforms Mary, returning her to her teenage form. Mary must speak the magic word out loud in order to change. If she is gagged or otherwise cannot speak, then she cannot change. A powerful enough electric discharge can transform Miss Marvel back into Mary and vice versa. This has worked both to his advantage and detriment oftentimes. As much of an advantage having two forms can be, there are also drawbacks. Her identity needs to stay hidden, or else no one would listen to Miss Marvel's advice. Also, she needs to keep her identity secret in order to protect herself and her family, along with having to hide from her parents. They would most certainly look for some way to protect Mary and keep her from what she was doing if they knew that she was Miss Marvel. Mary needs to say the words to change. She also needs to say the words to change back. To the opposite of Gag Order, instead of preventing Mary from saying the word, she can be forced or coerced into saying it, returning to her form as Mary and stripping her of her power.